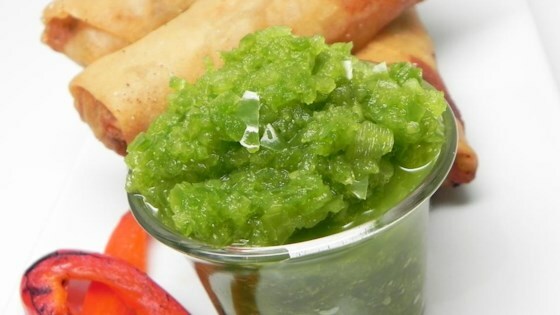 "This extremely potent sambal is a traditional side sauce for Thai spring rolls, but can be used anywhere you'd want a fiery hot green chile sauce." Bring a large pot of water to a rolling boil. Add the chilies and boil for about 5 minutes. Drain, discarding all of the water. Transfer the chilies to a food processor or blender. Process until you get a thick but slightly chunky sauce. Add the salt and briefly pulse to mix in. Store in a glass jar in the refrigerator for up to 3 weeks, or spoon into an ice cube tray and stored in a freezer bag. Roasted peppers meet roasted chayote. I did not care for this recipe. So Great! i have made this recipe over and over. This was ok but with the seeds removed I would hardly call it fiery and potent. I also thought it needed something else like garlic. It was ok but not something I would make again.